Protected vs. Non-Protected Environments | MaxBotix Inc.
How to distinguish between a protected and non-protected environment. 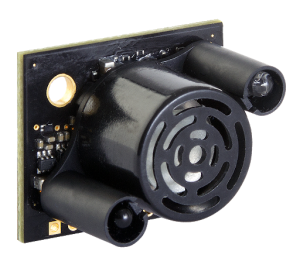 When choosing an ultrasonic sensor it is very important to be aware of the surrounding environment. This is a key factor and the first consideration when selecting a sensor. This requires looking around the environment that your sensor will be exposed to which can be as simple as the outdoor elements or as complicated as the type of people or animals that will be in the environment with the sensor. Consider whether you will be using the sensor during weather conditions that can damage the electrical components inside the transducer. 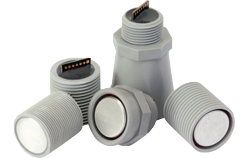 We manufacture many sensors which can withstand harsh outdoor conditions. 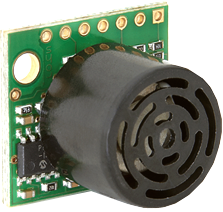 These sensors can also be used when a narrower beam is required, even inside the comfort of your own home. First, locate where the sensor will be placed and identify what can possibly come into contact with the sensor. You should next think about moisture; will the sensor be exposed to moisture in any form? As seen in the Illustration 1, moisture coming into contact with the front face of the transducer can seep into the openings on all of our EZ/AE sensors, which can cause irreparable damage to the sensor. Dust and harsh handling of the sensor as well have the potential to impact ranging and possibly cause damage. Another consideration for “Protected Environment” sensors are, who will be touching or interacting with the sensor. A harsh tapping on the front face of the sensor (common with young children) can cause damage. 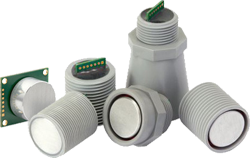 The EZ/AE sensors and all open-faced transducers are examples of “Protected Environment” sensors. Ensure that your application is suitable if you choose to use a sensor for protected environments. Being aware of the sensor surroundings ensures that the sensor meets the 200,000+ MTBF hours that these sensors are known for. Considerations for the WR (weather resistant) sensors are much more lax. 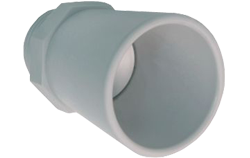 As seen in Illustration 2, the closed-face transducer, which only has the aluminum portion of the transducer exposed, allows for the IP67 weather resistance that outdoor elements may require. If you are only planning on using the sensor in fair weather conditions you may not need the IP67 rating, but you may want the more narrow beamwidth that the WR sensors provide. When dust, moisture, or harsh handling of the sensor is unavoidable, one of our WR sensors is ideal for your application. The IP67-rated sensors can also handle harsh chemicals or can be paired with a chemical resistant seal such as the F-Option for environments where diesel fuel or corrosive gases are present. As seen in Illustration 3 we offer many of the WR sensors in a variety of housings styles including pipe threading for applications with specific mounting requirements. If you are working in a “Non-Protected” environment this gives you the option to select the sensor housing that best fits your needs. Once the environment is known, choosing the perfect MaxBotix sensor is simple and easy. You can then categorize it as “Protected” or “Non-Protected” and choose the corresponding option from our Sensor Selection Guide to find the sensor that fits your application needs. If you are still unsure of the sensor that is right for you, contact us and we will be happy to help. Your perfect sensor is just a click away!